A petition on the White House website urges President Barack Obama to put the D.C. 'taxation without representation' license plate on the presidential limo. Now, two members of the D.C. City Council are meeting with White House officials to discuss that very issue. WASHINGTON – A petition on the White House website urges President Barack Obama to put the D.C. “taxation without representation” license plate on the presidential limo. Now, two members of the D.C. Council are meeting with White House officials to discuss that very issue. 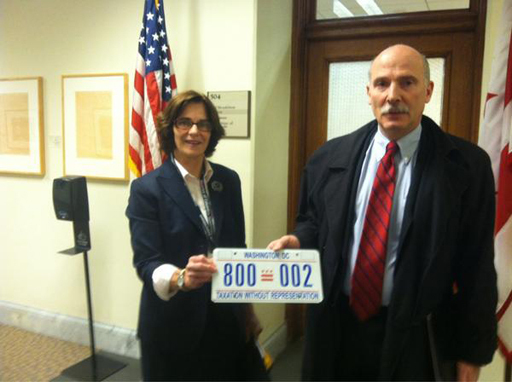 D.C. Council Chairman Phil Mendelson signed a resolution about the license plate Friday morning that will be given to Obama. He and Councilmember Mary Cheh then drove two blocks to meet with White House staffers. Cheh says she doesn’t expect to get an answer from the White House today. WTOP’s Mark Segraves contributed to this report. Follow @SegravesWTOP and @WTOP on Twitter.